The crochet mermaid tail used to be a pattern designed just for little babies, as a cocoon, primarily for photo props. That's not the case anymore, though! Today, given their surge in popularity, you can easily find mermaid tail blankets for all ages. Stitched up at the bottom like a sleeping bag, these crochet blankets are extra cozy. In addition to blankets, the mermaid tail design can be crocheted into scarves, tote bags, washcloths, and other accessories. These patterns offer whimsy for everyone to enjoy! An adorable crochet mermaid tail is the perfect choice for a baby's first costume or summer photos. As they get a little older, young children also enjoy playing dress-up with this type of outfit. This crochet pattern covers all of those bases, because it is available in eight sizes from newborn through approximately age 5. There are two styles to the pattern. Most of them have a bikini top that matches the mermaid tail, which is fairly classic for this type of design. However, the smallest sizes comes as a one-piece with the faux bikini top attached, because this slips more easily over a fussy newborn to quickly take photos. It's a practical twist made by a smart designer. The bikini tops for this pattern have a cute floral design. As a bonus, there is a matching floral crochet headband pattern for all ages. 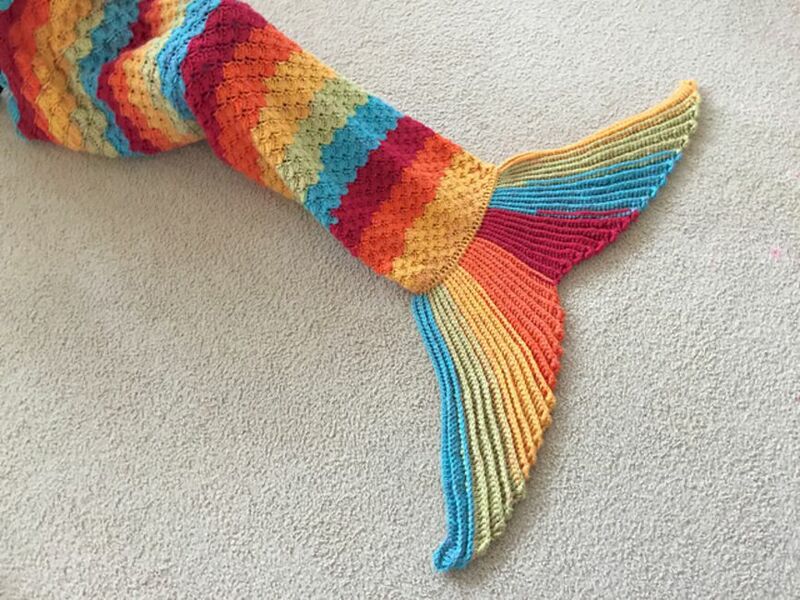 Cuddle up and read your favorite book while tucked into this warm crochet mermaid tail blanket. The pattern is a simple design of single crochet and double crochet stitches, with strategic decreasing that creates the tail shape. This free crochet pattern is written for three sizes (child, teen, and adult). It is available as a written pattern as well as a video tutorial. This surprisingly simple crochet mermaid tail blanket is made using almost entirely double crochet stitches, including some worked in the back loop only. The ruffles at the top add a creative flair to the design and also help to keep you comfy as you use the blanket. This free crochet blanket pattern is made using self-striping yarn. It comes in five sizes for all ages, and it is available as both a written pattern and a video tutorial. It begins with a magic ring, and there are links to tutorials for those who aren't familiar with starting in the round using that technique. Extra chunky yarn and a large size Q crochet hook means that this crochet mermaid tail blanket pattern works up really quickly. Vertical ribbing enhances the design and makes for a particularly warm lapghan. Mermaids are mythical, magical creatures that always bring a smile to your face. Perhaps the only thing more likely to do is a rainbow–combine the two and you've got a practically perfect pattern! This crochet pattern uses a shell stitch that looks a lot like the scales of a mermaid. In addition to crochet shell stitch, this pattern uses post stitches as well as basic stitches, including double crochet. What's really neat about this crochet pattern is that it's designed as a classic mermaid tail blanket, but it can also be adapted to wear as a scarf. The highly textured crocodile crochet stitch is a popular choice for mermaid tail patterns because it looks just like scales. It is used in this crochet scarf pattern, where it creates a very warm accessory that is finished off with more basic stitches to create the tail design. The scarf is designed for an average size of approximately 7" x 56" but includes instructions for making it shorter or longer to suit the size desired. A seaside theme is a popular decor choice for bathrooms, and the mermaid tail crochet washcloth is a great addition to that design. This crochet pattern is made using very simple stitches. Some simple twists and seaming create the tail shape. Add some ocean-scented soap or lotion and this makes a great gift! The mermaid tail crochet blanket is made like an oversized bag, and you can scale that idea down to create bags of various sizes. This small crochet pattern is for a treat bag. It's a perfect choice as a giveaway gift bag for a mermaid-themed birthday party! This bag is worked from the bottom-up, beginning in short rows for the tail and then going into rounds to complete the rest of the bag. The ruffles at the top are created using the crocodile stitch. It is all of the little details that make this mermaid tail crochet purse special. The body of the purse is made using chevron stitch that creates a ripple reminiscent of the waves. The tail is uniquely placed at the top of the purse, instead of the bottom, serving as a closure flap. An additional miniature fin is added to the purse strap. Rings are added if you want to make the optional matching mermaid tail chapstick holder. Add a simple tail design to any crochet cozy and you can create the mermaid effect. This free crochet pattern is for a cup cozy or can cozy. It is a perfect summertime drink cozy for a picnic at the beach.